Helper class with Windows Clipboard functions to get files from FileGroupDescriptorW or FileContents clipboard formats. ASP.NET SiteMapPath class to create Bootstrap Breadcrumb komponent for sitemap defined in Web.sitemap. Class with RunCommandAs method to run an command under another user credentials. Class for creating or sending email messages based on text or HTML template. Helper class with GetAbsoluteUrl, GetAppRelativeUrl and similar functions for ASP.NET web aplications. ASP.NET helper class for writing file content to the HTTP response. ASP.NET IHttpHandler for downloading files. SessionAuthenticationModule with 'Key not valid for use in specified state' error handling. Configuration section to set custom Sign certificate. Helper class to load and validate X509 Certificates from Windows certificate store. Uri helper class to get Uri from base and relative uri. Class gets information about platform, edition, version of operating system that are currently installed, system's processor and gets concatenated string with description of operating system. Class that contains Exception extension methods. Class that contains IClaimsIdentity and IPrincipal extension methods. Adds MapHttpHandler method to RouteCollection object. The code is by Phil Haack and was taken from http://haacked.com/archive/2009/11/04/routehandler-for-http-handlers.aspx. Represents a common dialog box to call up the Active Directory object Picker dialog. This dialog can by used to select users and groups or find computers. Helper class to create Security Descriptor from SDDL (Security Descriptor Definition Language) with ACL (Access Control List) strings. Vista style Select Folder dialog. Provides a System.Collections.Generic.Dictionary that stores key-value pairs in isolated storage for WPF or Windows Forms. Facebook OAuth 2.0 protocol authentication (server flow authentication). Windows Live ID (former Microsoft Account) authentication (using Live Connect REST API). Log messages to Event Log. Class that allows to perform a cast of any value type to the specific type without inserting boxing/unboxing operations. Class for triggering recurring Tasks. Class that allows access to any IEnumerable source in reader-based API. Provides the WithAdjacentGrouping extension method with custom implementation of the LINQ GroupBy method, which groups only adjacent elements of the input sequence. Sample WCF Service client proxy class. Silverlight TextBox control with Watermark support and IsTabStop settings automatic by IsReadOnly value. Silverlight style for Extended TextBox control with Watermark support. Adds Watermark support to Silverlight PasswordBox control. Silverlight style for PasswordBox control with Watermark support. Silverlight helper class to set DataGridColumn properties via binding. WrapPanel Silverlight Control with IScrollInfo support. Class that implements a workaround for a Silverlight XAML parser limitation that prevents the following syntax from working: . Fixing Silverlight and WPF DataGrid control. Fixing Silverlight DataGrid Row Auto-Resize only grows row height but won't shrink issue in DataGrid control. ErrorHandlingBehavior Attribute for Silverlight WCF services error handling. WCF Service host factory class for Silverlight Polling Duplex WCF NotificationService. Client proxy class for Silverlight Polling Duplex WCF NotificationService. MSBuild task to update File Version in the AssemblyInfo.cs file. Logger MSBuild BuildEngine for testing class. Helper class to update FileVersion in AssemblyInfo.cs file. Source Control helper class working on TFS current local workspace. Source Control helper class working on TFS workspace. Library with fully themed Windows Forms Controls (FW 4.0) using Vista Style API with fall back support. Button - Button with Vista special fade effects support and image support. ShieldButton - Button with UAC Shield icon displayed and with Vista special fade effects support. CommandLink - Windows Vista Command Link button control. LinkLabel - LinkLabel with the Windows Vista / Windows 7 rendering and behaviour and with correct Hand Cursor. Progressbar - ProgressBar with Windows Vista and Windows 7 state style support. CueComboBox - DropDown style ComboBox with ability to display Cue banner text. CueDropDownList - DropDown list style ComboBox with ability to display Cue banner text. CueTextBox - TextBox with ability to display Cue banner text. ListView - ListView with Explorer theming and semi-transparent selection. TreeView - TreeView with Explorer theming and autoscroll. LabeledDivider - Provides Windows Vista and Windows 7 styled divider with an option caption. TaskPanel - Panel for Windows Vista and Windows 7 tasks. Recommended for use with CommandLink buttons. HorizontalPanel - A horizontal panel for information and navigation in Windows Vista and Windows 7. VerticalPanel - A vertical panel for information and navigation in Windows Vista and Windows 7. 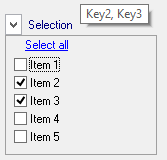 Windows Forms Control (FW 2.0) for multiple selection from checkboxes in drop-down list. Treeview/listview hybrid Windows Forms Control (FW 2.0). TreeListView is treeview with multiple columns and subnodes like in Listview. Horizontal Tab and Selection Panel Windows Forms (FW 2.0). Controls work similarly to the classic TabControl. Difference is location and display of switching tabs. Windows Forms (FW 2.0) TextBox control with a Hyperlink support. 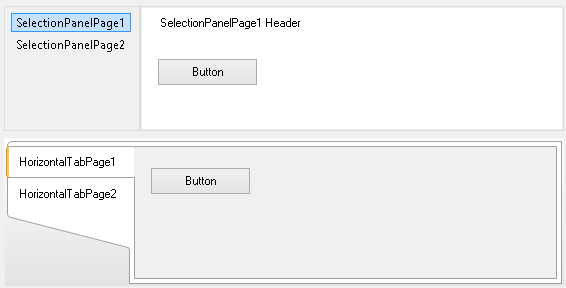 Split Button Control for WPF. Split Button Control for Silverlight. Silverlight ListBox control styled to one row in WrapPanel. More informations and example here Silverlight-Tips-ListBox-s-WrapPanelem. Group Box control for Silverlight. Dotnetnuke SEO Friendly Url Provider base on iFinity.FriendlyUrlProvider. MSBuild Task library to update File Version in the AssemblyInfo.cs file and TFS support. Setup binary resources package for WiX instalations. ASP.NET WebForms using SQL Server Compact with database creation. ASP.NET WebForms sample application to generate PDF dokument using SQL Server Reporting Services Local Reports. Local Report sample with globalization and localization support. ASP.NET WebForms sample application with custom error and NotFound (404) page, using ELMAH library). ASP.NET WebForms sample application for download files via handler with WIF 4.5 authentication. ASP.NET WebForms sample application for download files via handler with WIF 1.0 authentication. ASP.NET WebForms WIF 4.5 authentication sample. ASP.NET WebForms WIF 1.0 authentication sample. Google OAuth 2.0 protocol authentication sample. Facebook OAuth 2.0 protocol authentication sample. Windows Live ID (former Microsoft Account) authentication sample. WPF Windows 8 Aero 2 styles for .NET Framework 3.5. WPF Windows Themes different styles sample of SplitButton control. Base class for Windows Forms modal dialogs. WPF Drag & Drop sample. Silverlight Drag & Drop sample. Silverlight Polling Duplex WCF Service sample. Silverlight implicit styles with changes for ToolTip, ValidationToolTipTemplate and CheckBox controls. Sign PDF document with X509 certificate using iTextSharp. WiX instalations setup sample project. TFS Source Control Explorer Extension - Visual Studio 2015 Extension for Team Foundation Server Source Control Explorer. More informations and latest version is on Visual Studio Gallery. TFS Source Control Explorer Extension - Visual Studio 2013 Extension for Team Foundation Server Source Control Explorer. TFS Source Control Explorer Extension - Visual Studio 2012 Extension for Team Foundation Server Source Control Explorer. TFS Source Control Explorer Extension - Visual Studio 2010 Extension for Team Foundation Server Source Control Explorer. Because VSCT Powertoy is not officially available for Visual Studio 2012 and later, I made this updated standalone version of this tool. Časovač pro nastavení času odpočtu do vypnutí počítače. Ovládání je optimalizováno pro použití i na televizních obrazovkách.